It will probably not come as a surprise that this weekend's reported blowup of the commodities-based hedge fund over at OptionSellers.com was likely the result of none other than - wait for it - selling naked options on natural gas. 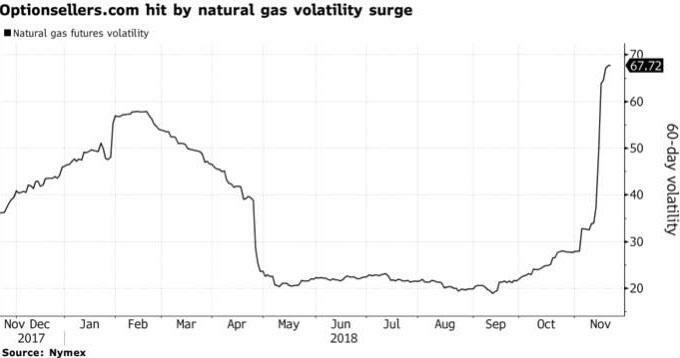 Media reports and a YouTube video of the fund's founder sobbing and apologizing for his blow up made the rounds after an unprecedented spike in natural gas futures. The hedge fund's founder, James Cordier, had been a long time advocate for selling naked options to trade. He wrote a book about it and even touted selling naked options as an investment strategy on Seeking Alpha. Of course, like anybody shorting volatility, an extremely popular strategy over the last decade, options writers hope to scrape up a premium while the underlying stays calm and parked. In this case, Cordier got a lesson on why managing that risk is important - and exactly what can happen when unexpected volatility strikes. Jack Scoville, vice president at Price Futures Group in Chicago, put it a different way: "People like to sell options rather than buying options because the odds of making money are better. However, as we saw with natural gas, that’s not always the case. You can get into a situation where the market is getting away from you pretty quickly." A nicer way to say it is that shorting options carries theoretically unlimited risk, which Cordier took on, and then passed on, to his clients. As Bloomberg confirms our own reports, Cordier's clients not only lost 100% of their account values but now also owe money to the fund's clearing broker. Meanwhile, the firm had its accounts liquidated by its clearing broker, FCStone. Jason T. Albin, a lawyer at ChapmanAlbin LLC, confirmed to Bloomberg that some of the accounts held naked options positions and he estimated that losses from the failure of the fund could run in excess of $150 million: "FCStone borrowed on margin against their clients’ accounts to cover, which caused them to not only lose 100 percent of their account values, but now they also owe FCStone for the loans." “While writing naked options may sound outrageously aggressive and even frightening to some, if it is done correctly, one should be able to sleep very well at night. The downside, of course, is that the market potentially can exceed your risk parameter." Wouldn't the thought of the market exceeding your risk parameter be the last thing that would have you sleeping well at night? Naturally, financial Twitter poked fun at the video. While we would like to assume that this will be a lesson to investors and that it could mark the beginning of the end of the "shorting volatility" craze that has made even Target managers rich, the most likely scenario is that nobody has learned anything from this unfortunate episode of risk mismanagement. 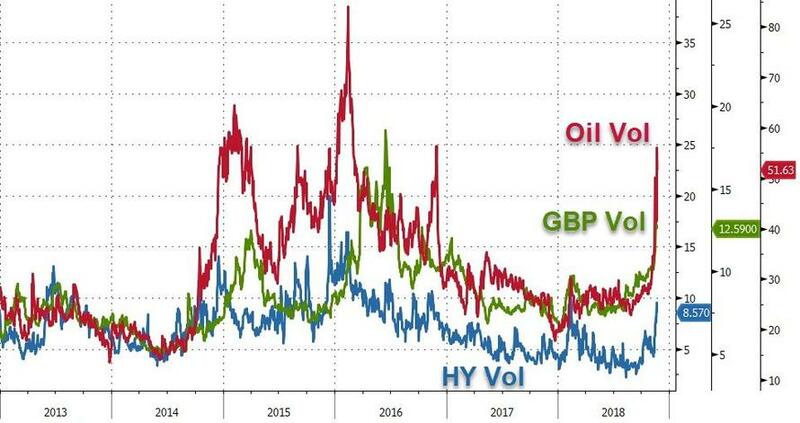 However, as Bloomberg reports, it appears there are plenty of other funds out there willing to short volatility across various asset classes on any spike. A hedge fund is placing a risky wager equivalent to 11 percent of its volatility portfolio that the fear gripping global debt markets will prove short-lived. Credence Capital, the volatility-trading arm of KM Cube Asset Management with 110 million euros ($125 million), is shorting expected price swings in the world’s largest junk-bond ETF, which has nose-dived this month in the most violent upheaval since 2016. 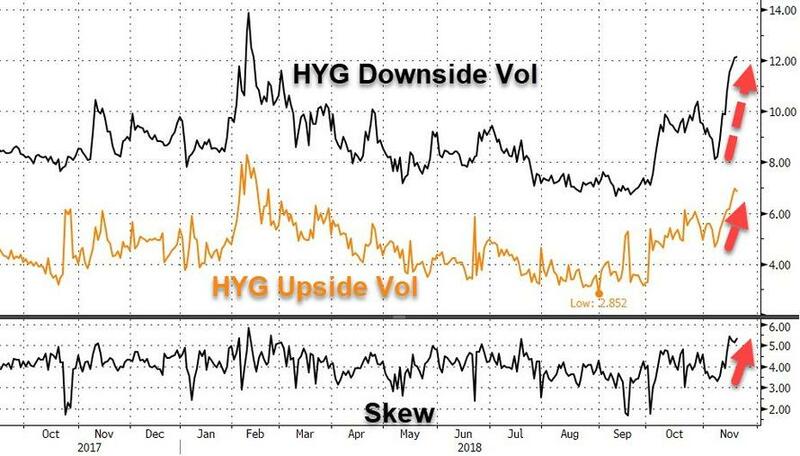 "...this kind of vol risk premium is the highest since the February volmageddon." "In the past few days we are observing higher vol in assets other than equities," said Couletsis. In addition to shorting volatility of the iShares bond fund, the firm has also been selling it on the Brexit-battered British pound and oil. Of course, one can never know when that mini-spike to sell becomes a mega-spike and "Cordiers" you. As Bloomberg sums up so eloquently - shorting volatility can be immensely profitable -- until it’s not.